Accor, the world’s leading hotel operator in the economy and budget segment with over 1,700 hotels is celebrating today its 1000th ibis hotel around the world. Two years after starting reviewing economy hotel codes in depth and modernizing the ibis, ibis Styles and ibis budget brands, the Group is getting tangible results from the unprecedented ibis family project and stepping onwards, unveiling the new ibis room and ibis kitchen, its renewed restaurant concept. The Group started its revolution in 2011 with the overhaul of its three economic brands within one single ibis family. From this renewal project stems a coherent and attractive portfolio with the same simplicity, modernity and well-being spearheaded by ibis, and a better identified and stronger positioning of each brand. It results into significant benefits for the 1000 ibis, 233 ibis Styles and 506 ibis budget. Sébastien Bazin, Accor Chairman and CEO states: “Through its ibis family of 1,700 hotels, Accor is the leading international player on the 4 continents, Europe, Latin America, Asia Pacific and Africa Middle East. Accor’s new strategy redefined around its two core competencies – HotelServices and HotelInvest – will enable ibis, ibis Styles and ibis budget to strengthen both their innovation capacities and their leadership: in Europe, including through an acceleration of investments in owned properties; and by capturing new opportunities mainly through management and franchise in emerging countries”. Over 2 years, Accor has opened a total of over 200 ibis family hotels, hence an average of one opening every 3 days. Boosted by the project of revitalization, the ibis family is experiencing a sustained development. In 2013, 52% of the Group’s openings were made under the ibis family umbrella versus 39% in 2012. Moreover, within 4 years, Accor’s economic brands will have substantially strengthened their leadership position worldwide, with the ibis family representing close to half of the Group’s global pipeline, over 62,000 rooms in the pipeline of which 38% in Asia Pacific, 30% in Latin America and 27% in Europe. “Ibis, Ibis Styles and ibis budget are now fully benefiting from the new brand architecture and modernization. Over the past 2 years, ibis family has created the conditions to outperform all the competition”, explains Peter Verhoeven, Chief Operating Officer HotelServices Northern, Central and Eastern Europe. The revitalization project has greatly increased the awareness of the 3 ibis brands. In particular, ibis shows the highest level of spontaneous awareness among all economic brands in 10 European countries. Revamping of the public areas – over 300 worldwide – and massive deployment of the “Sweet bedTM” by ibis – over 100,000 beds – have strengthened both guests’ perception of the modernity of the brand and guests’ satisfaction levels. Especially guests’ satisfaction with bed comfort experience grew +5 points over the past 2 years to reach an impressive 90% of clients satisfied or very satisfied with bed comfort. The massive roll-out of the ibis family project combined with the opportunistic and mastered management of distribution channels fully effective during the second half of the year enabled a strong acceleration of revenue for economy segment with a particular growth on the fourth-quarter: revenue up 4.1% on Q4 (+2.4% like-for-like during 2013) and RevPar (revenue per available room) up 4.2% on Q4 (+1.9% over 2013). Most key countries contributed to the segment's performance with a particularly strong RevPar growth over the fourth quarter in the United Kingdom (+14.1%), Germany (+5.2%), Southern Europe (Spain +6.2% and Italy +4.2%) and Brazil (+2.6%). In France, Accor’s performance on the economic segment remains pretty steady with a RevPar up 0.7% like-for-like on Q4, a strong performance in light of the rest of the French markets. These strong results have also enabled the ibis brands to further strengthen their market shares in all key markets (France, Germany, UK, Benelux) with a steady increase of RevPar Index, key measure of the Group’s performance compared to competitors. ibis, an ever pioneering brand for 40 years! Grégoire Champetier, Accor Global Chief Marketing Officer points out “Innovation has been at the core of ibis since its creation in 1974. At a very quick and massive pace, we have broken all the codes of economic hospitality business in each defining element of the brand such as comfort, bedding, design, distribution, communication… We’ve completely reinvented the industry’s standard demonstrating that well-being, spirit, emotions and experience are as fundamental as functionality and price in the economic segment”. To streamline and modernize its restaurants and vitalize the way guests are experiencing these living spaces, ibis launches its ibis kitchen. With a focus on flexibility, ibis kitchen is disrupting traditional habits: at different times of the day and suitably to the diversity of hotels, restaurants and lobbies are blended, extended and opened-up through the lounge space. It is a place where guests can interact and exchange in a friendly atmosphere at any times of the day, work, relax, meet and of course lunch and have dinner. Adding warmth and modernity, ibis kitchen features a trendy design, revisited furniture, as well as a strong, visual and unique identity perfectly in keeping with the informal and contemporary spirit of the new common areas of the brand. 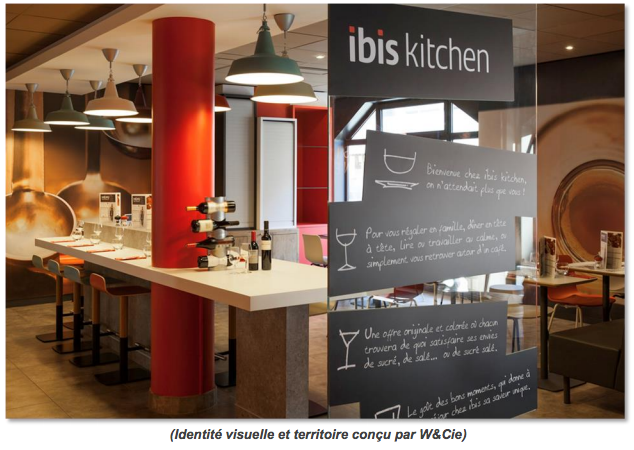 Ibis plans to roll out over 400 restaurants across its worldwide network by 2015. Ibis new room: the ultimate design at hand In line with its renewed bedding concept and redesigned common areas, the brand also announces the creation of a new room designed by Archange Studio. Deployed in future renovated and new construction hotels, it will offer a unique and completely revisited guest experience in the economy segment: printed decorative panels, the new lighting atmosphere, the bedhead and the carpeted floor contribute to intense feeling of warmth and comfort. 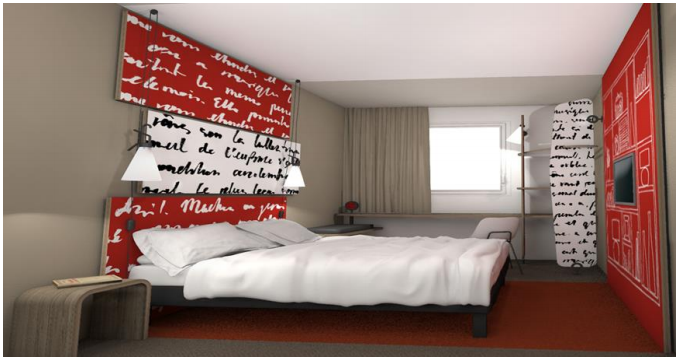 A first pilot will be rolled-out at the ibis Rotterdam City Centre, in Netherlands.